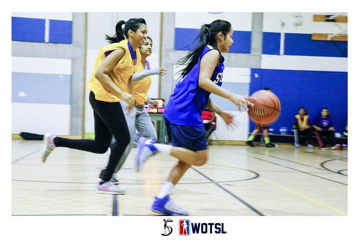 Paving a path for women, the Women’s Ontario Tamil Sports League (WOTSL) has created a platform for females 16 years of age and over across the GTA to play collaborative sports. This multi-sport league, founded in October 2015, provides participants with a fun environment to play sports at a recreational level with some healthy competition. For the 2015-2016 season, the two chosen sports were volleyball and basketball. WOTSL is comprised of 88 members of various ages, ethnicities and athletic skill-sets. This sports league, hosted at Stephen Leacock Collegiate Institute in Toronto, Ontario, is designed to provide women with a platform to flourish athletically and socially. Many of the players have voiced their negative experiences and stigmas associated with women participating in sports. The objective of the WOTSL is to eliminate these barriers and improve the quality of life for its members via sports in a positive and safe space. The mission of the WOTSL is also to create a professional league, which is reflected in the quality of its operations, staff, sponsorship, event organization, jerseys, statistics and regulations. The executive team works very hard and has years of professional experience from leadership, marketing, finance, web development, and project management. The WOTSL is now onto its fourth month of activity. To keep players even more captivated, the WOTSL hosts special events throughout the season such as the Co-Ed Basketball Tournament on February 6th and the upcoming All-Star event which will consist of Skills competitions, Rising Stars games, 3-Point competitions and All-Star games. This is a great opportunity for anyone to be part of an exciting and empowering association for women to participate in sport. If you are interested in sponsoring or volunteering the WOTSL, please contact info@wotsl.ca. This entry was posted on Tuesday, February 16th, 2016 at 6:05 pm	and is filed under Athletics/Sports, News, Uncategorized. You can follow any responses to this entry through the RSS 2.0 feed. You can leave a response, or trackback from your own site.